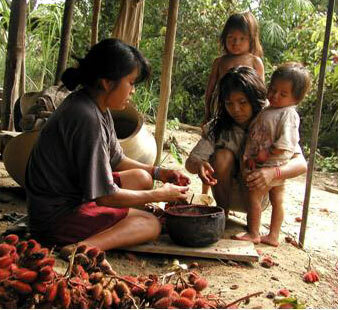 The Achuar people live in the Upper Amazon, in Ecuador, and in Peru. They were previously called the Jivaro people. Jivaro warriors were known to shrink the heads of conquered enemies and transform them into magical objects. Today, the Achuar continue their fight against the oil companies that threaten their way of life by encroaching on their land. AÏNY works with three Achuar communities and the NAE (Nacionalidad Achuar del Ecuador), an organization representing the 5,000 Achuars of Ecuador, for the production of Ungurahua and Achioté oil.